"Ice" verjus uses the full flavour potential of the grapes. 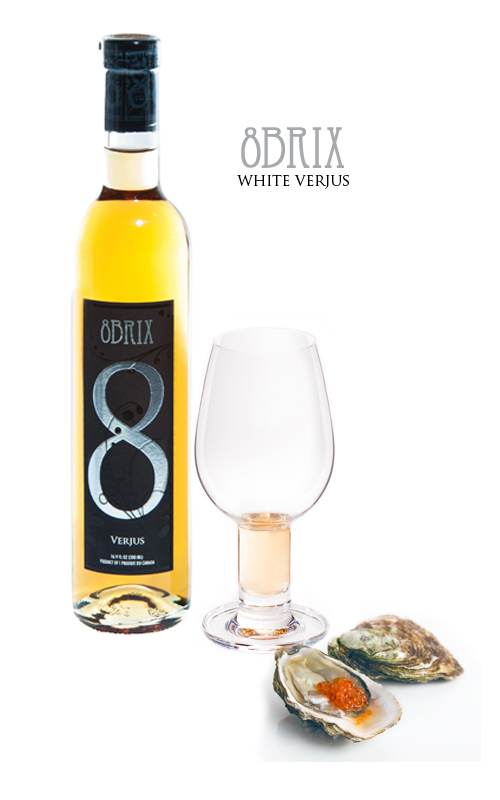 8 Brix is a seasonal product, made with the juice of Minus 8 icewine grapes. Premium wine grapes are hand-picked at five intervals between August when they are sour and unripe, to January when they are our sweet Minus 8 icewine grapes. As the grapes ripen over the months, flavours develop and sweetness increases. Blending juices from several harvest intervals plays sweet off of sour, with a layered, delicious palate of all the flavours the grapes offer. Each year 8 Brix Verjus is made for release in December. Because of the limited amount, please order early. Appearance: Ranges in colour from yellow, to deep orange, to amber to rose (depending on the batch). Palate: Medium sweet, herbaceous, sweet and sour, well-balanced with noticeable - zingy, tangy, mouthwatering acidity and notes of sour candy on the long finish. This is fun to drink when served lightly chilled; but also a great condiment and a wonderful addition to your cooking repertoire. This fabulous product is similar in taste to white wine, but a little sourer. We think it's a better replacement for a wine in cooking recipes.